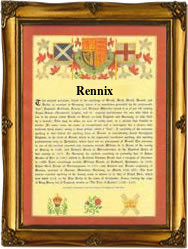 Recorded as Rennick, Renwick, Rennicks, Rennix and possibly others, this unusual name is English. It is locational, and found mainly in the north of England and Scotland. The source for the name is a place called Renwick, in the county of Cumberland, near to the town of Penrith, and the Scottish borders. The placename is first recorded in the year 1178 as Ravenwich, and has two possible meanings. It may mean Hraefn's dwelling-place from the Olde English pre 7th century personal name Hraefn, the raven, and probably used in the tranferred sense of someone with very black hair, with wic, usually a dairy farm. The other interpretation is 'The farm on the River Raven', from the dark appearance of the water. Examples of the surname recordings include Ann Rennick who married John Elliott at St Georges chapel, Hanover Square, Westminster, in 1727, whilst Henry Rennicks was christened at Newlands by Keswick in June 1824. The first recorded spelling of the family name in surviving church registers may be that of Thomas Renicke. He married Elizabeth Rumley at Kirkoswald, Cumberland, on May 10th 1632, during the reign of King Charles 1st of England. He was later to be known as The Martyr, after he was beheaded in 1649. Surnames became necessary when governments introduced personal taxation. In England this was sometimes known as the Poll Tax. Throughout the centuries, surnames in every country have continued to "develop" often leading to astonishing variants of the original spelling.